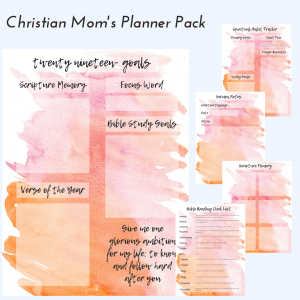 Planner worksheets for Christian moms to use for spiritual goal setting. Includes 7 printable pages that fit a Happy Planner. Download and print the Christian Mom’s Planner Pack to add to your Happy Planner. It is a great way to customize your planner so that it is usable for your spiritual life in the upcoming new year. Includes 7 easy to use worksheets sized for a Happy Planner. Beautiful and Easy to Use Design! When you purchase, you will receive a digital file containing 7 pages of worksheets for setting goals in your spiritual life. All are designed to be cut to fit your Happy Planner, and can be printed multiple times to suit your needs. It features a beautiful watercolor background with spaces to set goals for scripture memory, Bible reading and more. Print the worksheets front and back for a user friendly addition to your planner. Print the sermon notes pages to add to your planner so that you have only one notebook to carry with you to church! The memory verse pages can allow you to have all the verses you learn this year at your fingertips to review anytime. Track the number of days that you have your quiet time each week. Easily identify the days you struggle to fit in your quiet time. Look back over the prayer requests that you record for encouragement when you see God answering them. Get on track for 2019 by setting achievable goals for your walk with Christ!